A military budget (or military expenditure), also known as a defense budget, is the amount of financial resources dedicated by an entity (most often a nation or a state), to raising and maintaining an armed forces. Military budgets often reflect how strongly an entity perceives the likelihood of threats against it, or the amount of aggression it wishes to employ. It also gives an idea of how much financing should be provided for the upcoming year. The size of a budget also reflects the entity's ability to fund military activities. Factors include the size of that entity's economy, other financial demands on that entity, and the willingness of that entity's government or people to fund such military activity. Generally excluded from military expenditures is spending on internal law enforcement and disabled veteran rehabilitation. According to the Stockholm International Peace Research Institute, in 2011, world military expenditure for the world amounted to 1.735 trillion US$. The world's five largest military spenders (the United States, China, Russia, the United Kingdom and France) are recognized to be world powers with each being a veto-wielding permanent member of the United Nations Security Council, which was established after the end of World War II. However in 2012, Japan spent slightly more on defence than France. Saudi Arabia is another notable military spender of recent times and now ranks 7th. This list is based on the Stockholm International Peace Research Institute (SIPRI) Yearbook 2012 which includes a list on the world's top 15 military spenders in 2011, based on current market exchange rates. The world's top 5 military spenders in 2012. ^ The figures for Saudi Arabia include expenditure for public order and safety and might be slight overestimates. In 2004, the yearly report by the Stockholm International Peace Research Institute showed that the purchase of military products by NATO member nations during the year 2003 rose by 11 percent, compared to 2002 (6.5 percent in volume). In some countries, this budget had been increased to the level maintained during the Cold War. The military budget of the United States lead this increase. U.S. purchases accounted for 47% of world military expenditure in 2003. A total of about US$415 billion. Additional funding for the War in Iraq and the supplementary expense of US$83 billion accounted for much of the increase. Other spending accounted for only 3.5 percent of it. The military budgets of the United Kingdom, France and Italy represented about 15% of world military spending. France and the United Kingdom increased their equipment expenses, so as not only to act in US military operations with the same technological level of their ally, but also to be able to act independently in smaller military campaigns. (Such as was seen in the Libya). Among non-NATO nations, Japan spent US$46.9 billion in 2003, The People's Republic of China, US$32.8 billion, and Russia, US$13 billion. 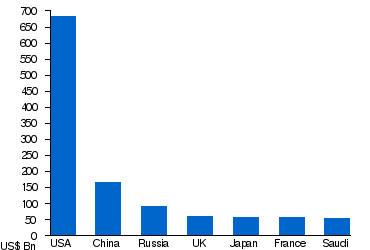 As a percentage share of world military spending this represented 5%, 4%, and 1%, respectively. The effects of military expenditure on a nation's economy and society, and what determines military expenditure, are notable issues in political science and economics. There are controversial findings and theories regarding these topics. ↑ Statistics on Defense Expenditures in the U.S. per Capita, 1990-2011, NATO, April 2012. ↑ 3.0 3.1 "The 15 countries with the highest military expenditure in 2012 (table)" (PDF). Stockholm International Peace Research Institute. http://books.sipri.org/product_info?c_product_id=458#. Retrieved 15 April 2013.